The full code of the memory allocator is provided on my GITHub profile in CWorking repository. 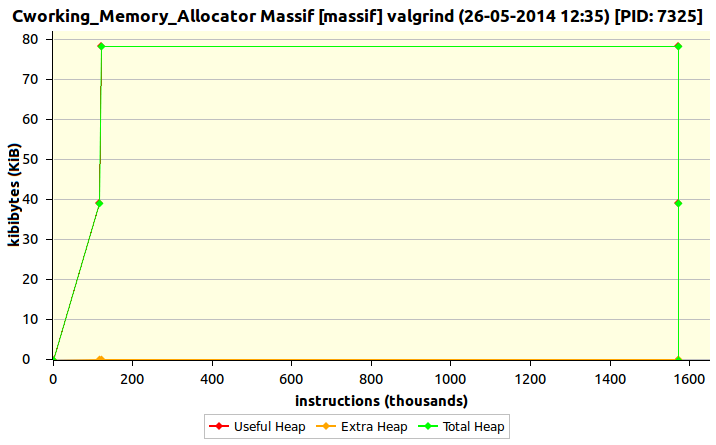 Here I would like to show the result of memory allocation algorithm. Sample application allocates pool for 10000, 4 byte memory blocks. Each block is occupied in a loop by an integer number. Finally the memory blocks are tested, released and the whole pool is removed. As you can see above, memory is allocated only at the beginning. During the program, the pool is used frequently and finally the whole memory is released. This confirms that this memory allocator might be a good solution for the systems where a low fragmentation is required e.g for embedded systems. Moreover, such algorithm helps to protect our system against the memory leaks after the unexpected crash. I encourage you to download the code and try to understand it and maybe optimize the implemented algorithm. ← Be brave. Talk with them.